Northwest, to Nairobi – sounds unintuitive, but maps, as magical as they are, can’t help but lie when it comes to distances like these. My first change of planes in Seattle is not so far from the great circle route to Kenya, lying just south of the equator, half a world away. Total distance of the flight will be something like 9709 miles, only a few hundred longer than the shortest path of 9608. And for context, the farthest you can get from any spot on earth is 12,416 miles. only a few hours further. Here, climbing out over the coastal range in California, it’s Monday morning – when I get off KLM 565 in Nairobi tomorrow night, it will have already been a long trip, and that’ll just be the beginning of it. The world outside my portal at 12A on Delta Flight 232 has crawled about as far north as we’re going to, moving eastward now before arcing south, to Iceland and Amsterdam. 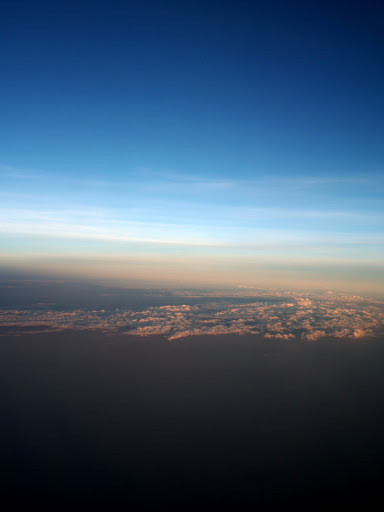 From 39,000 feet, the night sky outside has the appearance of freezer burn. It is impossibly cold, dark and inhuman – beyond the plastic, steel and glass of our cocoon is a world where even the idea of light and warmth is heresy. And somewhere invisibly far below is Summit Camp, a miniscule research outpost on the crest of the Greenland ice sheet. It’s at Summit where climatologists are getting some of the most damning evidence about the change happening to our planet. I’ve had friends there from time to time. But not now, not now. The miracle of flight. Only a few hours later – a change of plane in Amsterdam, the Alps, the Mediterranian. And now, we’ve crossed from the pebbled moonscape of the Libyan desert to Sudan’s flowing dunes. I feel I know the Libyan desert from Saint Exupery, but the geography of Sudan is a blank spot on my mental map. I feel like I am flying over an ocean, caught on film and tinted sepia. The waves, the sand, the wind – you can see even from here how it lifts the dust and carries it forever far away. There are no signs of life, nothing below to indicate that this world has ever been anything but sand and dust, baked by an unsleeping sun. What am I doing here? Here, in a pressurized metal tube, eight miles up over the Sudanese desert? I’m finding the question a little alarming – sort of like when you were sixteen, right after your parents asked “What were you thinking?! ?” And, as you looked around you at the wreckage of glitter and glue gun debris that used to be the living room, you get the idea that you should have asked yourself that question just a little earlier in the project. Below, there’s a snake of dark sand – from above, I can see clusters of dots – vegetation of some sort – along its banks. It’s dry now, but when the rains come, I suppose they give these wisps of life enough water to hold on for another year. Somehow. But back to me, and why I’m headed for Nairobi. Yeah, I can give myself permission by saying I’m helping the Carter Center out here. But I know I’m kidding myself: they’ve got plenty of volunteers – they don’t need me. I’m doing it for myself. It’s so I’ll have an adventure, a story to tell. So I’ll have something to write about, to talk about the next time cocktail party conversation ebbs into uncomfortable silence. I had a conversation with myself a while back. From the in-flight map, Juba is a hundred or so miles west. There are clouds now – not the parched wisps that don’t even cast a shadow, but real clouds, billowing like white mountains in the day’s last light. Below them, lost in the gray, must be lakes, or a place where lakes once were, illuminated only by thousands of tiny yellow lights tracing their outlines. I try to imagine what they are – and come up empty. And then, on the horizon, the moon rises, swollen, overripe and tinged with red. Forty five minutes to Nairobi – here we go.